Once upon a time, there lives a family of bears in the forests. There was great big Papa Bear, medium sized Mama Bear, and little Baby Bear. One day, Mama Bear cooked a pot of porridge as breakfast for herself, Papa Bear and Baby Bear. The porridge is very hot so the three bears decided to go strolling in the woods for a while until the porridge cooled down. After the three bears had left, a little girl named Goldilocks happened to pass by their cottage. Goldilocks was curious so she pushed the door of the cottage. The door was not locked so Goldilocks went into the cottage. Goldilocks asked, “Is anyone here?” No one answered so Goldilocks didn’t care at all. Goldilocks saw three bowls of porridge on the table; a great big bowl of porridge for Papa Bear; a medium sized bowl of porridge for Mama Bear; and a little bowl for Baby Bear. Goldilocks felt hungry so she picked up Papa Bear great big bowl and tasted the porridge. “Ouch! The porridge is so hot!” Goldilocks cried as she dropped the spoon. So Goldilocks picked up Mama Bear medium sized bowl and tasted the porridge. “Ouch! This bowl of porridge is also very hot!” Goldilocks cried out as she dropped the spoon. Then Goldilocks picked up Baby Bear little bowl and tasted the porridge. The porridge taste just nice. Then Goldilocks saw three chairs before the fireplace; the great big chair for Papa Bear; the medium sized chair for Mama Bear; and the tiny chair for Baby Bear. Goldilocks climbed into the great big chair of Papa Bear and sat on it but it is too hard. So Goldilocks climbed onto the medium sized chair of Mama Bear and sat on it but it is too soft. Finally Goldilocks climbed onto the tiny chair of Little bear and sat on it and she feels it is just nice. Suddenly a loud sound was heard, “CRAAAACK!” and the tiny chair of Baby Bear broke because Goldilocks is much too heavy for the tiny chair. 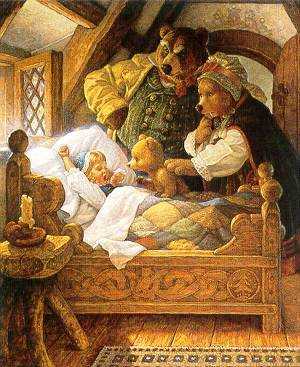 Goldilocks climbed up the stairs and to her surprise she found three beds: a great big bed for Papa Bear; a medium sized bed for Mama Bear; and a tiny bed for Baby Bear. Goldilocks felt tired so she climbed up to the great big bed of Papa Bear. “This bed is too hard for me!” Goldilocks cried out. So Goldilocks climbed onto the medium sized bed of Mama Bear. “This bed is too soft for me.” Goldilocks cried out. Finally Goldilocks climbed onto the tiny bed for Baby Bear. Goldilocks feels it is just nice for her and she fell asleep. After a while, the three bears returned from their walk in the woods. When they enter the house, they were shocked to find everything is so messy. Then the three bears saw their chairs before the fire place. Afterwards, the three bears went upstairs to their bedroom. “Someone slept on my bed!” Papa Bear cried out in his big voice. “Someone slept on my bed!” Mama Bear cried out in her medium sized voice. “Look! A girl is sleeping on my bed!” Baby Bear cried out in his tiny voice. At that moment, Goldilocks awoke from her sleep. When she saw the three grizzly bears, she got panicked and jumped out of the window. Goldilocks ran all the way back to her home. The three bears never see Goldilocks anymore since that day.